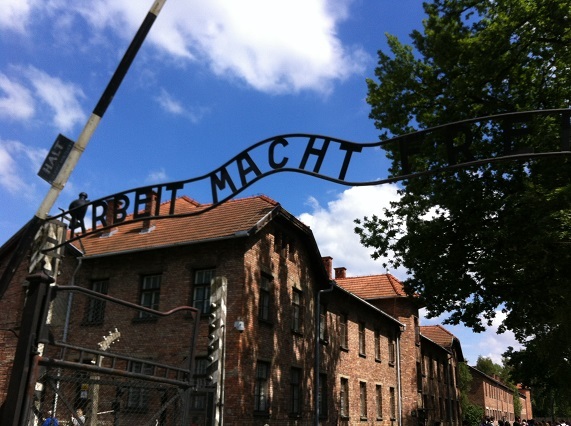 Is there a more dreaded word in the language of man than the word "Auschwitz"? Is there a more dreaded place on this planet? Oceans can be filled with the tears and there would still be more tears. Huge libraries can be filled with the testimonies, the stories, the facts, and there would still be more to be told and passed on. 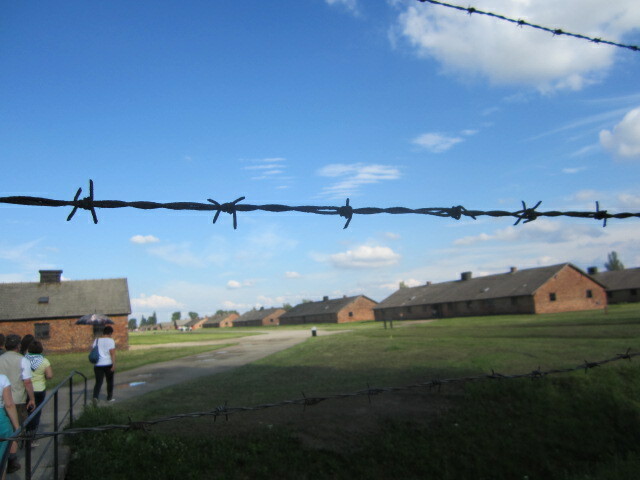 Far be it from me to even attempt to describe this horrific place. But it is just a place, and these are only buildings. A place is not evil, only people are evil. And those people are gone. Earth, cover not our blood, heavens, make room for our cry. For we shall not be silent. After a four hour drive we see the sign to the little Polish village Oświęcim from which the Nazis took the name "Auschwitz". Yes, it may sound strange. 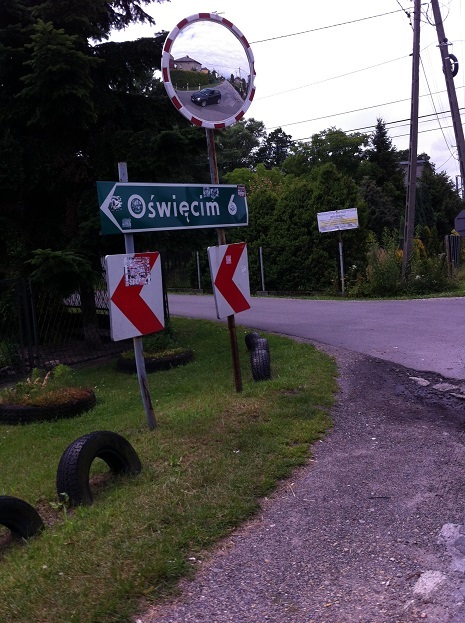 But here it is; Oświęcim, just a regular town, with a regular coffee shop, and regular quiet people. All so ordinary, but here it all happened. I knew I must have a cup of coffee to prepare myself for this experience. I fantasize about bringing a cup of coffee to the some of the inmates, whose spirits are surely here. 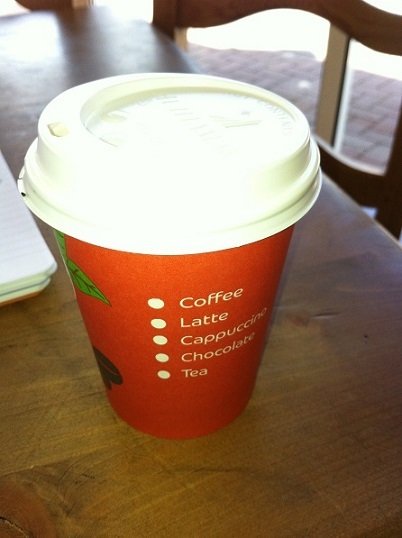 How they would rejoice and enjoy a good latte! 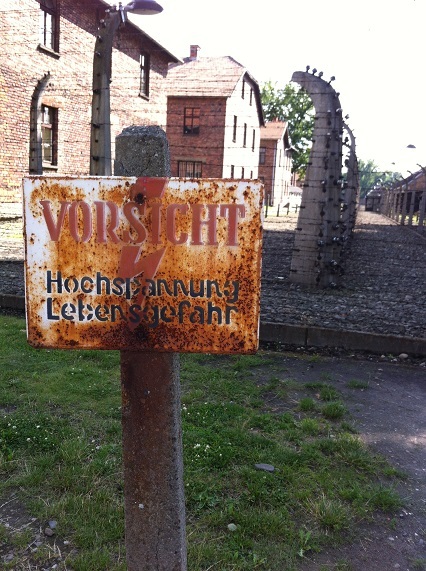 "Arbeit Macht Frei" - Work makes you free, so felt Rudolf Hoess. He placed this sign here and actually believed in it. 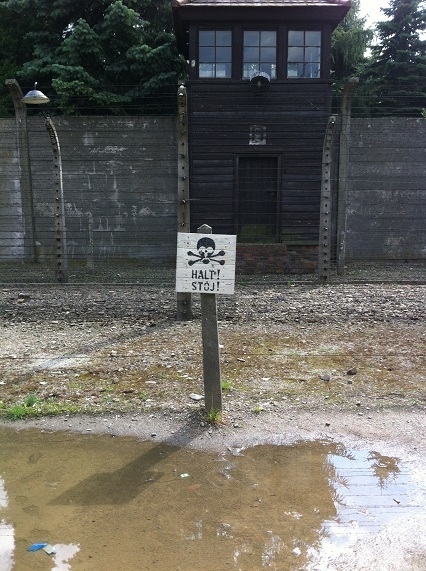 At first this was not a death camp. 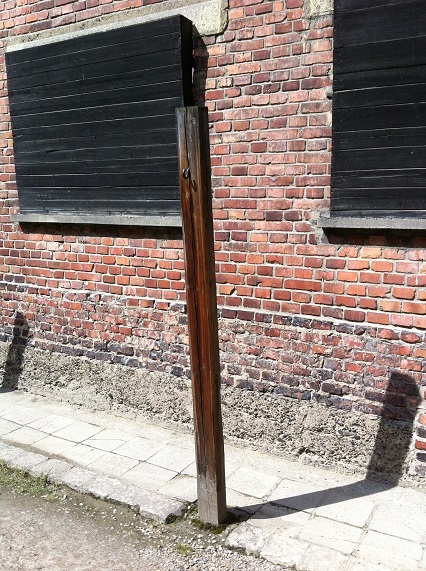 The sign, which weighs 88lb, was made in 1940 by a group of Polish political prisoners led by inmate no. 1010, Jan Liwacz. 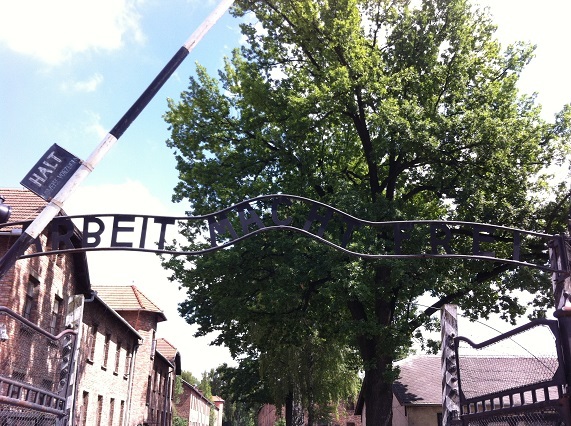 Arbeit Macht Frei was the slogan for many of the Nazi regime's concentration and extermination camps. 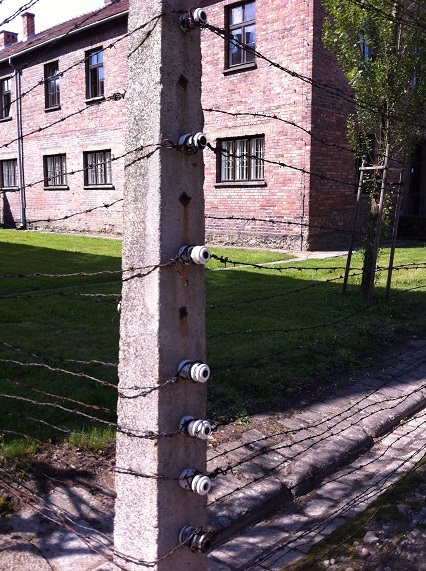 The barbed wires were electrified. Welcome to Hell. 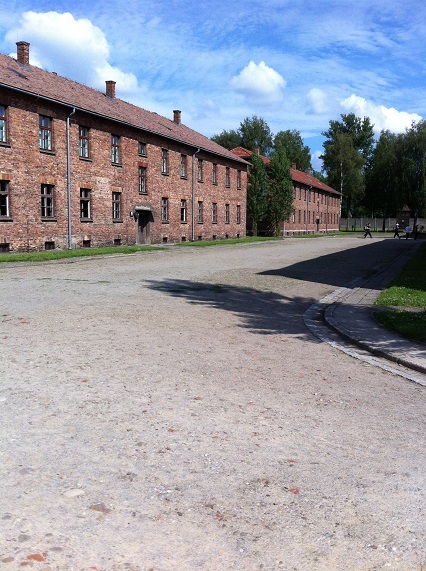 Approximately 1.5 million people, mainly Jews, died in Auschwitz which was built in Nazi-occupied Poland. 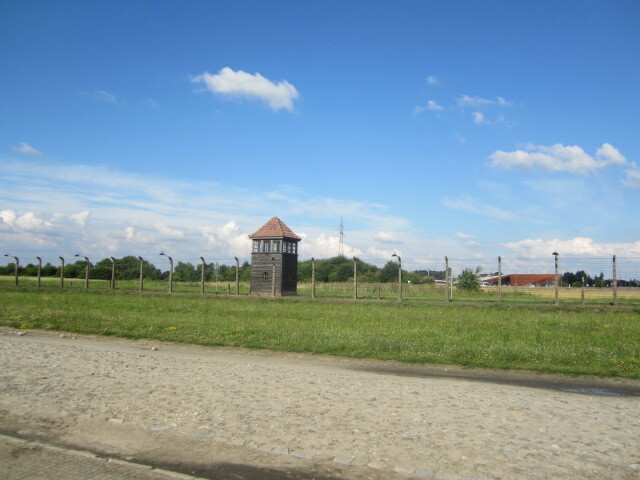 About 500 acres of the former death camp was turned into a museum after the end of the war. The camp was larger and more "Impressive" in its day. Benjamin Jacobs, a Jewish dental student from Poland, spent five years in Nazi concentration camps, including Auschwitz. He died in 2004. 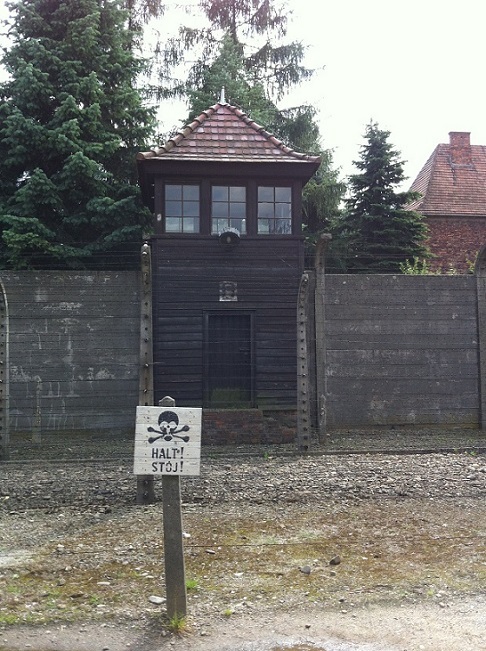 In this extract from his memoir, The Dentist of Auschwitz, he recalls seeing the sign "Arbeit Macht Frei" for the first time. "Traumatized, starved, and soaked with human waste, we looked to be the inhuman, useless creatures the Nazis had characterized us as being. This camp did not look like any I had seen before. Along the inside ran what seemed to be an electric line. 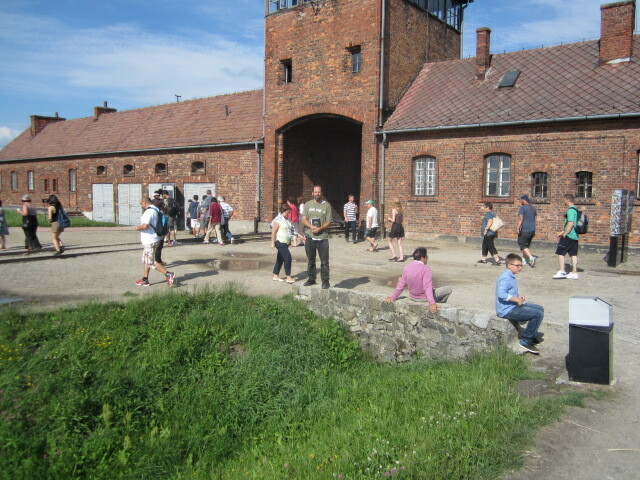 Perched above in towers were green-uniformed Waffen SS. 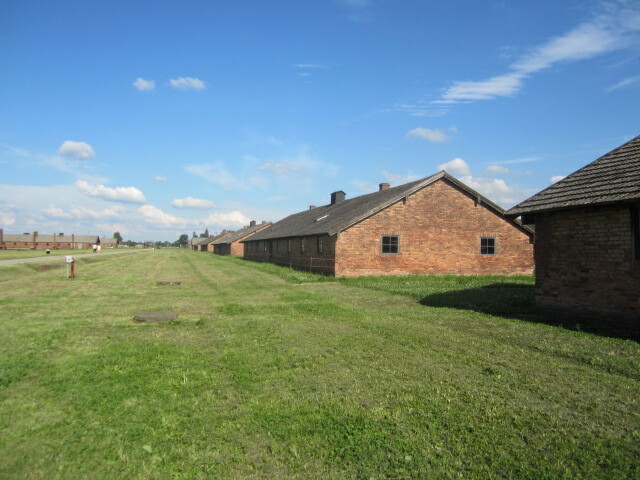 Their guns pointed into the camp. "As we were driven further, we heard an orchestra playing and people singing. 'Today Poland. Tomorrow the entire world,' they sang in German. Each refrain had a different verse and mentioned a different country. When the trucks stopped, we heard: 'We're marching on England today, and tomorrow on the entire world!' "A sign at the gate read: 'Stop, high voltage!' 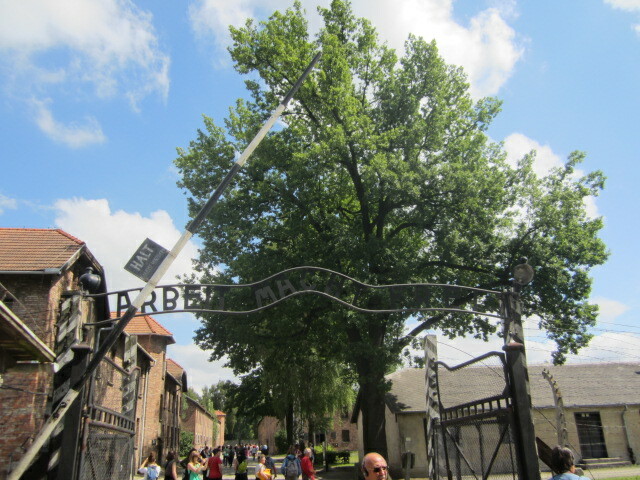 Above the gate another sign read 'Auschwitz', and below it, 'Arbeit Macht Frei.' We knew it wasn't meant to be a promise, not even a pledge. The truth was that we were here to work until we died. In front of a small shack a conductor directed 30 musicians. The scene was grotesque. "Once inside, our truck turned left and stopped in front of one of the huge three-story brick buildings. 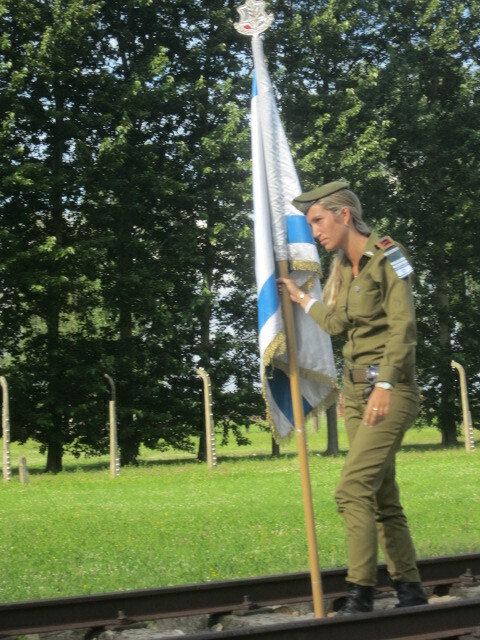 A smartly dressed SS sergeant took charge of us. 'Down,' he shouted, as the rest of the SS began to enforce his order." 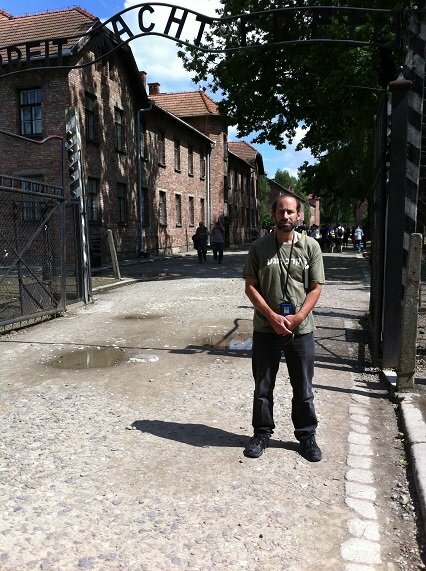 Moshe at the gates of Auschwitz, no words necessary. I think of my relatives who were here before me. I think of them all although I do not even know most of the names. I am here as a Krav Maga instructor from Israel. There were striped prisoner uniforms, I wear a Krav Maga instructor T shirt. 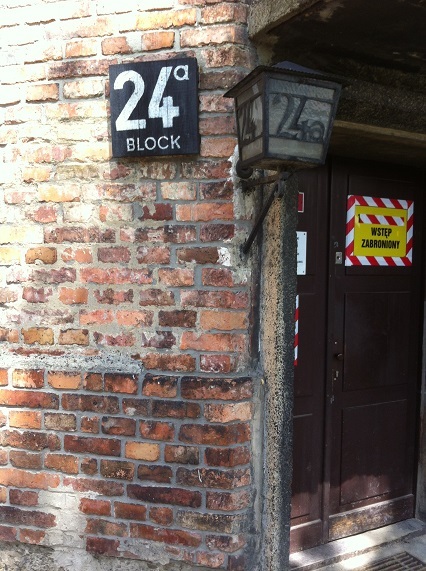 "In the summer of 1941, Himmler summoned me to Berlin to inform me of the fateful order that envisaged the mass extermination of Jews from almost every part of Europe, and which resulted in Auschwitz becoming the largest human slaughter house that history had ever known...."
The infamous Block 24. Look it up. 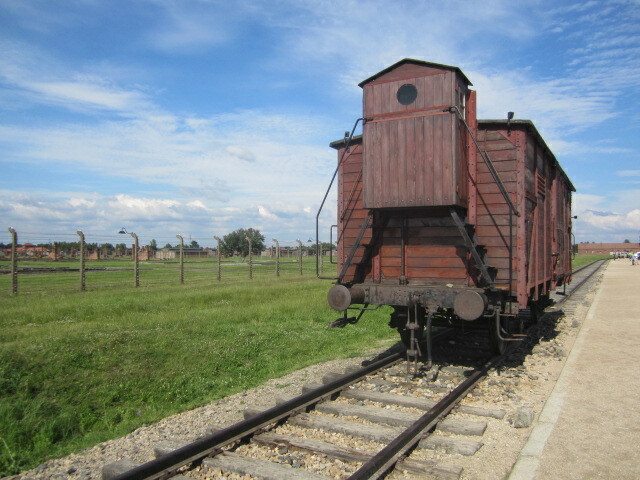 "When the Jewish transports unloaded on arrival, their luggage was left on the platform until all the Jews had been taken to the extermination buildings or into the camp. During the early days all the luggage would then be brought by a transport detachment to the sorting office, Canada 1 (so named for the wealth of Canada that these Jewish good represented), where it would be sorted and disinfected. 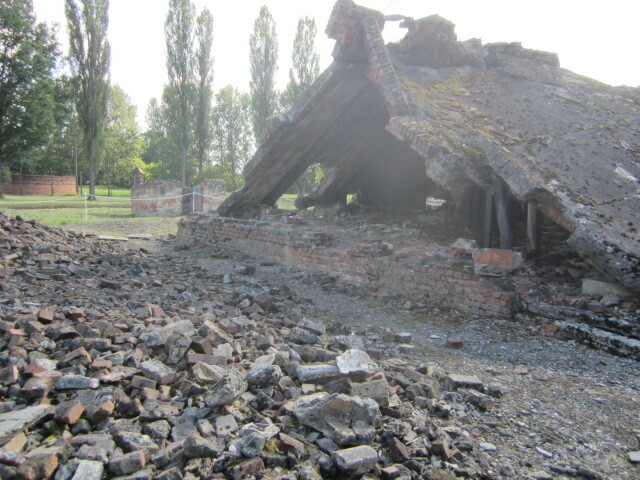 The clothing of those who had been gassed in bunker 1 and 2 or in crematoria 1 50 4 was also brought tho the sorting office. What we see preserved in Auschwitz today and in Yad Va Shem in Jerusalem is but the tiniest remnant of the goods stolen from Jews. Watches from Jews were sent to German soldiers on the front, the hair from killed Jewish women was used to pad the winter jackets of German soldiers on the front. Clothing was sent to needy Germans. Every items was used. And the Jews in the camp had to do all the work associated with this ugly task. "you have inherited and also murdered". A curse on their "souls" forever and eternity. 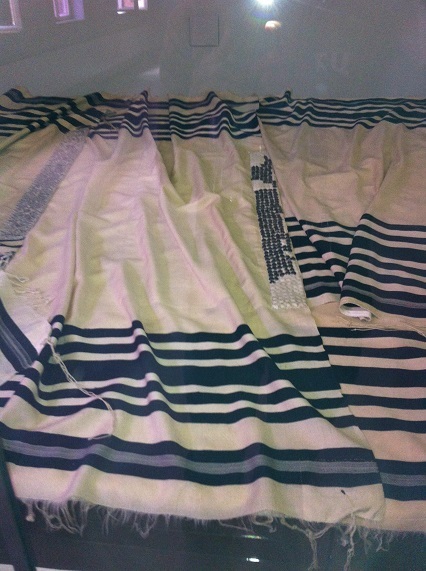 Jewish prayer shawls. Men brought these precious religious items with them to pray, but never had the opportunity. 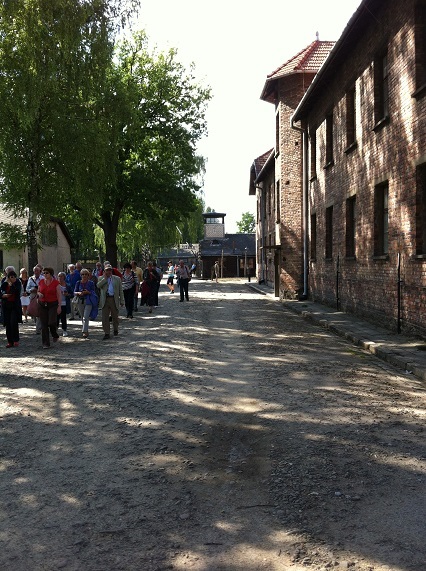 The Talitoth were taken from them; many of these men were sent directly to the gas chambers while others worked hard and lived from one to three months before dieing of disease or being shoved into a gas chamber. Not a great photo, but this is luggage. 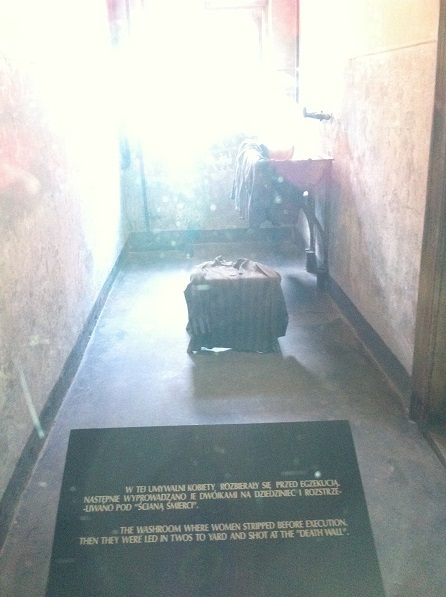 Thousands of suitcases, carefully packed by Jews and others coming to Auschwitz believing that here they would have some sort of a life. This Jewish man carefully marked his luggage, Singer Leon, and used an identification number as if he were taking a business flight and needed a tag to collect his luggage. Little did he realize that he would never see his luggage again and that certain death awaited him. 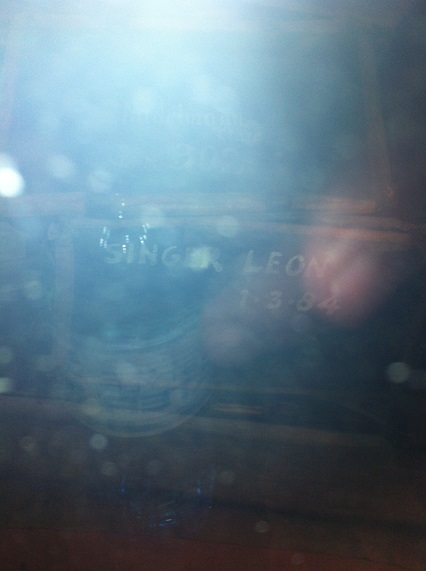 Leon, we look at your luggage and we take a moment to think of you. Who were you? What precious belongings did you pack? What were your hopes? your fears? Leon, you too were once a human being, with feelings and fears and anxiety. Leon, we mourn for you. Children's toys, broken. Children brought toys with them, how could they know that all children would be sent at once to the gas chambers for immediate death? How could they know what evil exists in the heart of man? 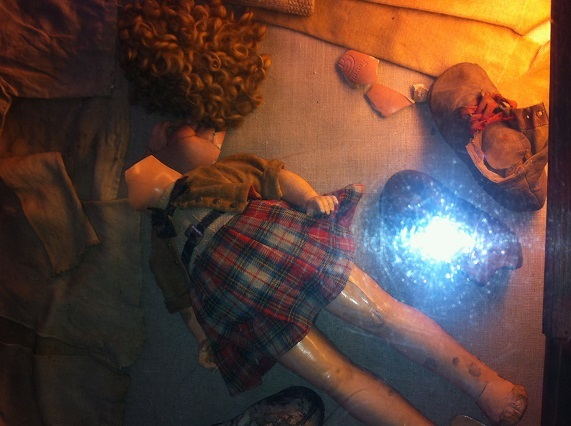 Does anything say Auschwitz more than this; the broken toys of dead children? "On one occasion two small children were so absorbed in some game that they quite refused to let their mother tear them away from it. Even the Jews of the Special Department were reluctant to pick the children up. The imploring look in the eyes of the mother, who certainly knew what was happening, is something I shall never forget. 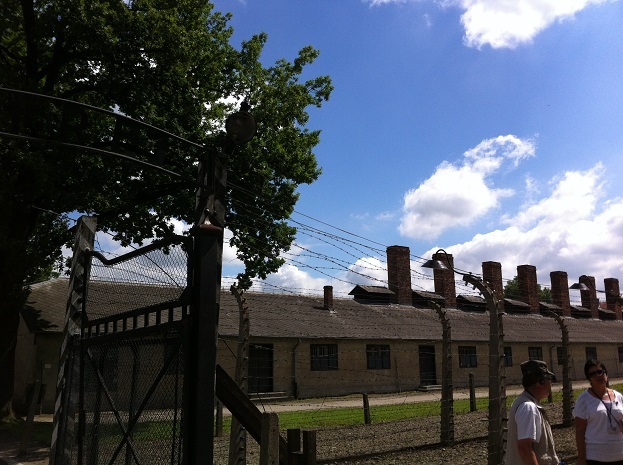 The people were already in the gas chamber and becoming restive, and I had to act. Everyone was looking at me. 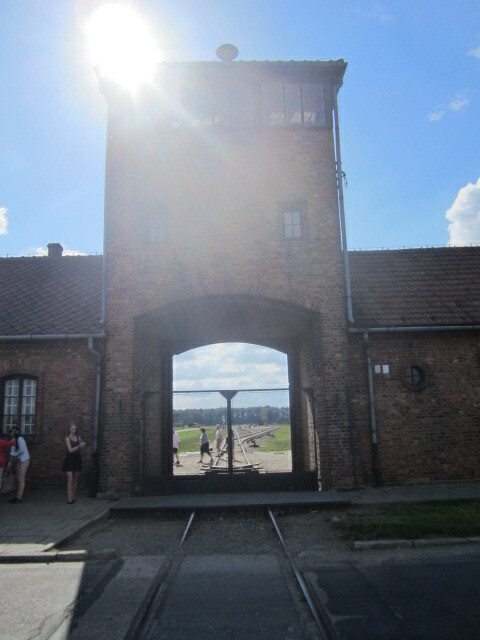 I nodded to the junior non-commissioned officer on duty and he picked up the screaming, struggling children in his arms and carried them into the gas chamber, accompanied by their mother who was weeping in the most heart-rendering fashion". The weeping, the screaming, that look in a mother's eye...Earth, cover not our blood, heavens, hear our unending cry. I stop and I pause. I know that Antisemitism still exists. I know that it is only a matter of time before it has the opportunity to rise again. There is no doubt. The past is the future. There is no doubt. Only we can make a difference, only our attitude, our training, our struggle to be free, can make the difference. We must learn the lesson well. We must fully restore our warrior attitude. Let the old spirit come across these dry bones and raise them into a great army of freedom fighters. Today we fight for the freedom of Israel, and for the safety of the Jews of Paris who are under constant attack. And we know. 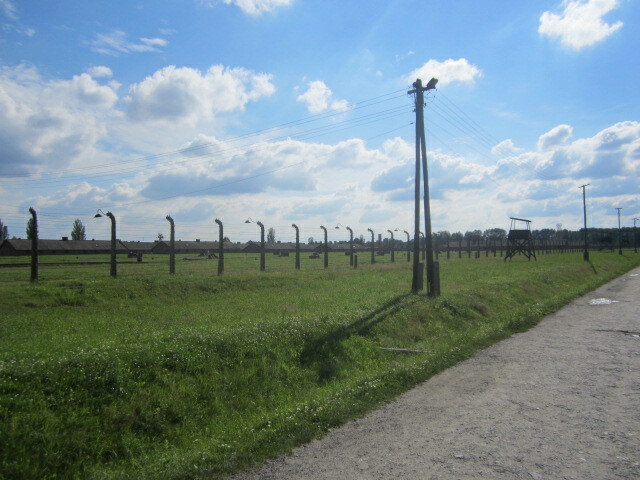 We know that if we do not fight back there is always Auschwitz waiting for us. 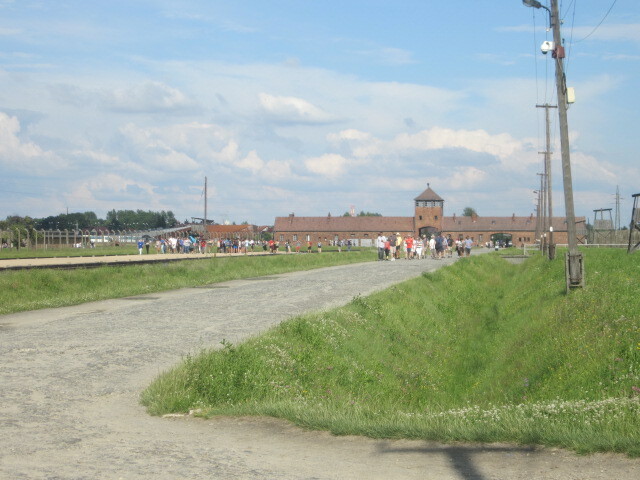 Auschwitz does not go away. Auschwitz is eternal. When you train, know that the alternative is....Auschwitz! 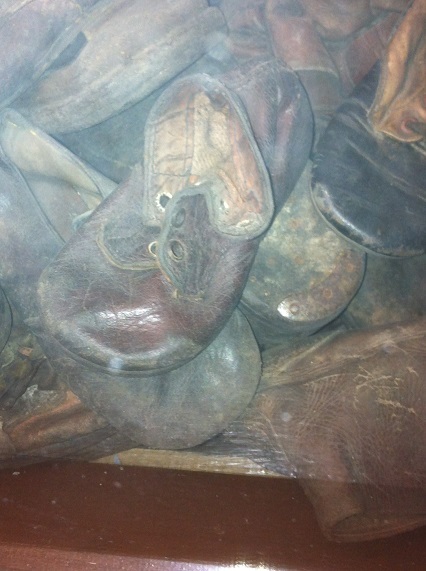 Shoes, there are countless, endless shoes. Think! 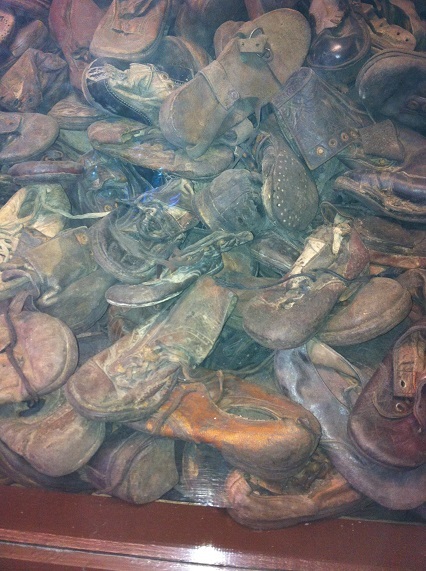 Each pair of shoes represents someone who was murdered. Each pair of shoes has a story to tell. Each was purchased on a happy day, look how many are children's shoes! Imagine the excitement of buying your child a brand new pair of shoes. Imagine putting them on the child for the first time. Imagine the look in the child's innocent and happy eyes. Each pair represents a real person, with a name....Think about it. A small shoe, the shoe of an innocent child. Today as terrorists dig tunnels into Israel and armed to the teeth they emerge from these tunnels and head towards our towns and villages, this is what they have in mind! This is their plan; to murder little children. Let us not forget that our enemies in the Middle East fully supported Nazism and the "Final solution to the Jewish question". This is what they supported then and this is what they plan to do to us now. For the sake of this dead child and for the sake of all the children we must be strong. Never Again. Never Again. Never Again. Israel stands strong. For those who are naive. Please follow the social medias; youtube, Facebook, you will see the Jew hatred clearly. In the minds of these haters Auschwitz was a very good idea. Let none of us think this is only history. This is still our reality and we must always be on guard. 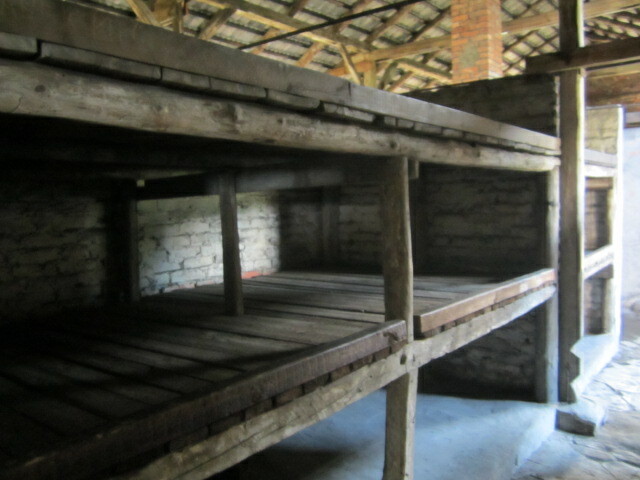 Prisoner barracks in Auschwitz l. These barracks were made of stone. 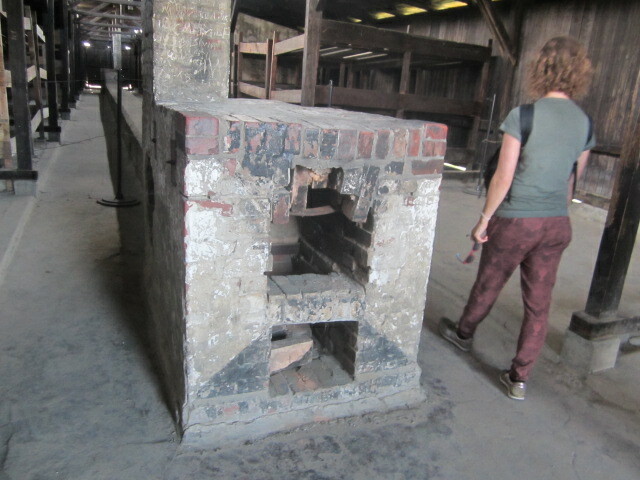 These were originally built in 1916 as part of a farm labor camp. The first prisoners to arrive here with Polish along with some Jews. Just a building. But this was the notorious Block 10. 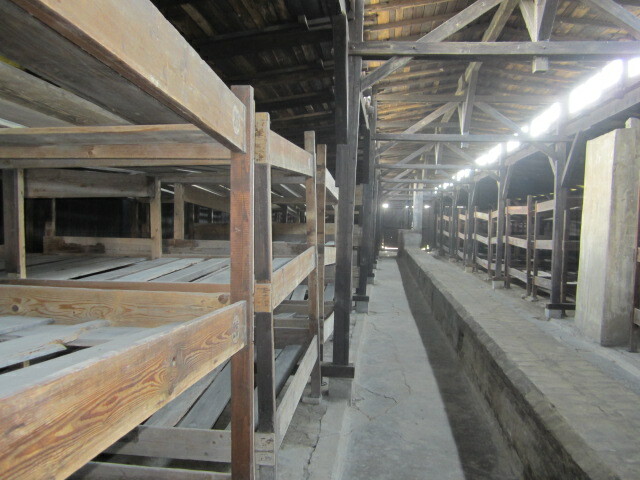 Block 10 was a cellblock at the Auschwitz Concentration Camp where women and men were used as experimental subjects for German doctors. The experiments in Block 10 ranged from skin testing for reaction to relatively gentle substances to giving phenol injections to the heart for immediate dissection. 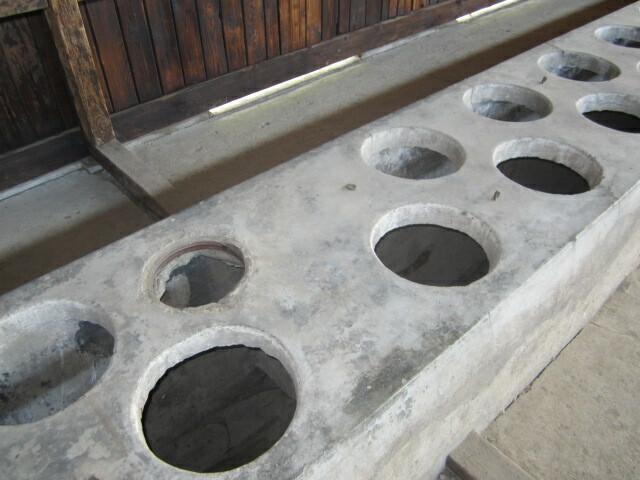 Although Block 10 was in the men's camps, the experiments conducted were mostly for women. 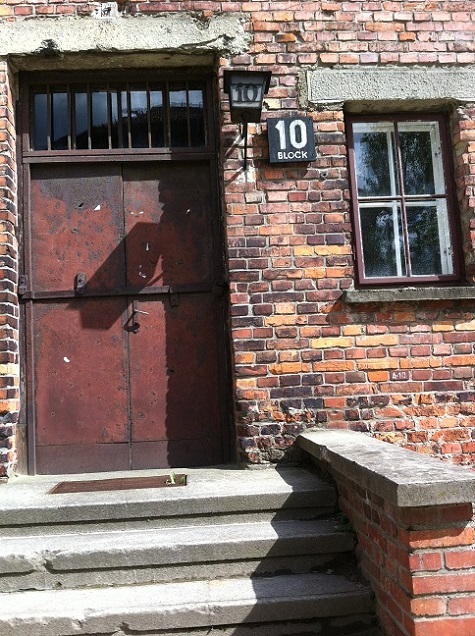 To please the “elite” prisoners, the Germans would house prostitutes in Block 10. 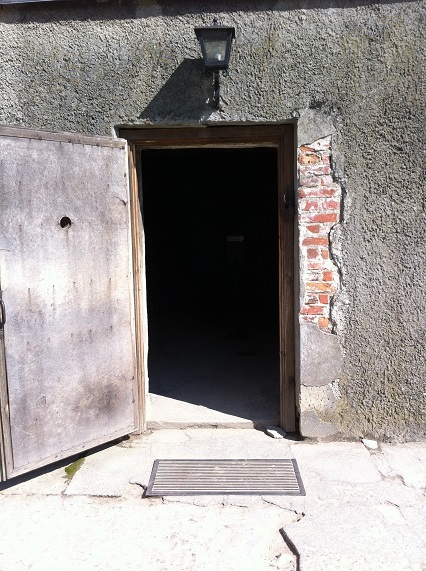 The main doctors who worked in Block 10 were Carl Clauberg, Horst Schumann, Eduard Wirths, Bruno Weber and August Hirt. Each of them had different methods in doing experiments on the inmates. 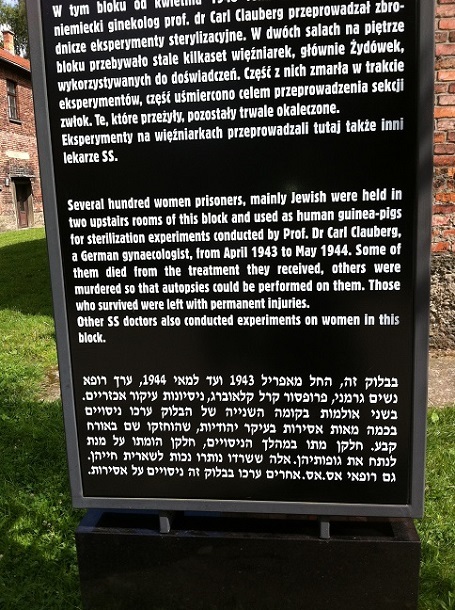 The victims at Auschwitz were also exported anywhere else experimental subjects were needed. 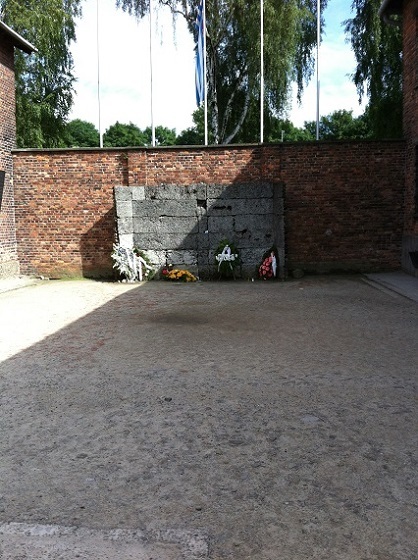 For example, twenty Jewish children were transported to the Neuengamme concentration camp in Hamburg where they were injected with virulent tubercular serum and subjected to other experiments, and later murdered at the Bullenhuser Damm school. Children's clothing. 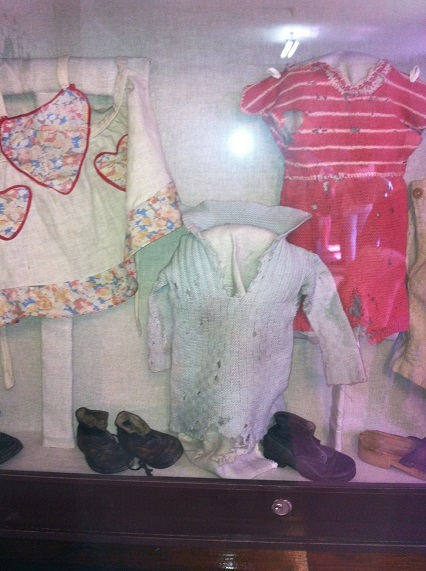 Those who wore these articles of clothing were sent immediately to the gas chambers. "There was nothing new in anti-semitism. It has always existed all over the world, but has only come into the limelight when the Jews have pushed themselves forward too much..."
Rudolf Hoess, Commandant of Auschwitz, hung for war crimes by the Polish government. In this quiet peaceful area, which could be the scene of any quiet American college campus, the notorious roll call took place. 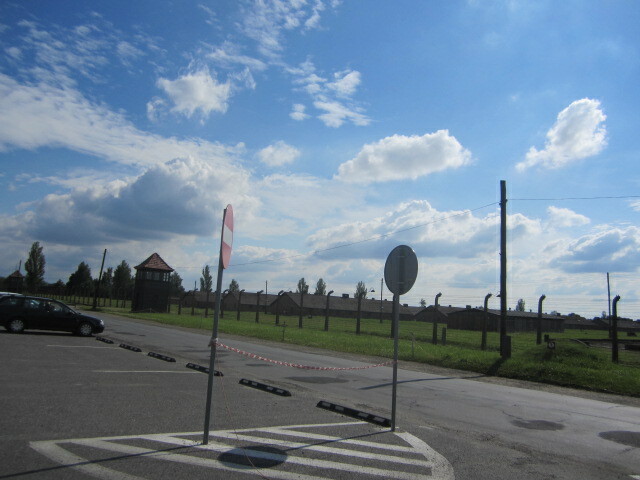 Thousands of prisoners had to stand here for hours on end and be counted, again and again. If it was suspected that a prisoner was missing, the count had to be restarted. One roll call took 19 hours. This took place in extreme heat and in bitter cold. There was a special both for the Nazi officer to stand so he should not catch cold. 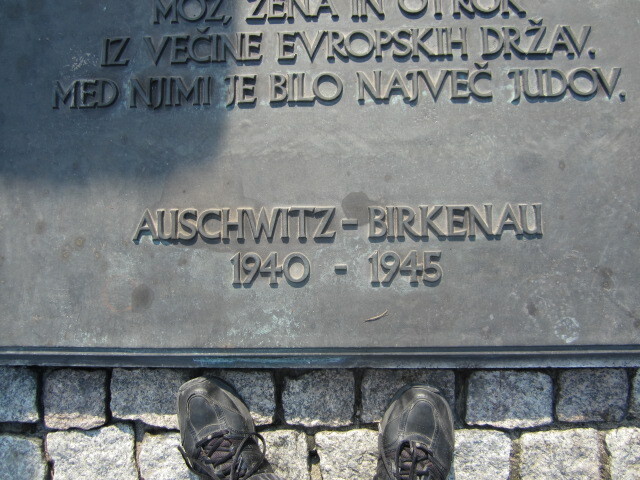 Many prisoners dropped dead while standing in this very spot where we stand now. They stood and they died on the spot. Earth, cover not their blood and let these atrocities never be forgotten. Death row. Here women stripped before their execution. Imagine! You can clearly see the sink, here they washed up and prepared for their deaths. 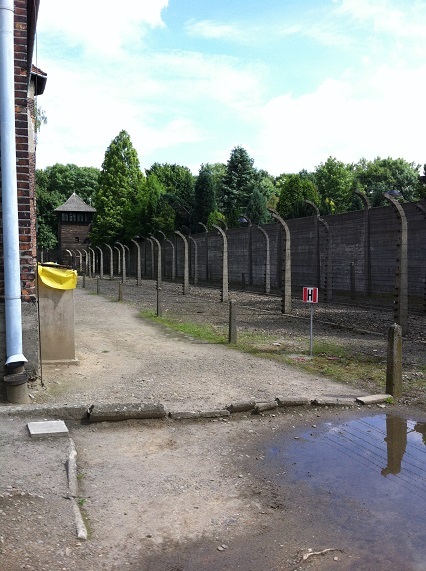 Death Wall; Here many prisoners were shot dead. Anyone who became a "problem" was taken here to resolve the problem. 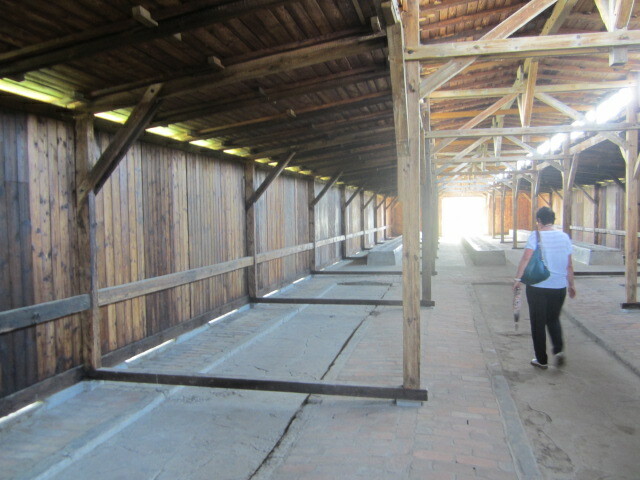 Here prisoners were hung with their arms behind their backs, for hours. 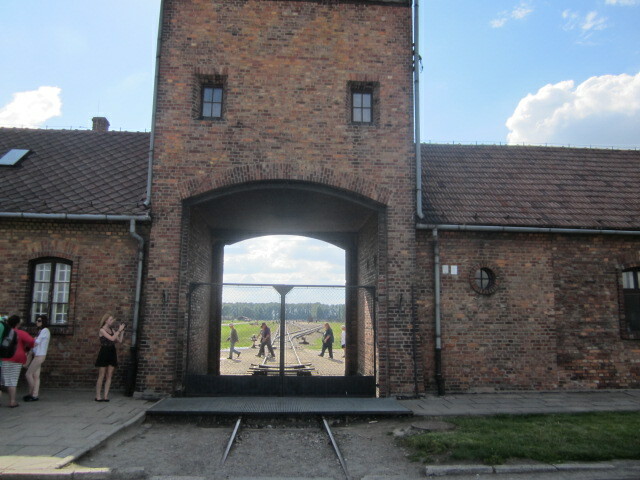 Here many prisoners were hung together. All those on role call would see them and get the message. Vorsicht hochspannung - Caution high voltage. Today it looks so peaceful, green grass, nice old buildings, perfect setting for a liberal arts college, only the barbed wire fences remind us of the ultimate evil that existed here. The door to hell. 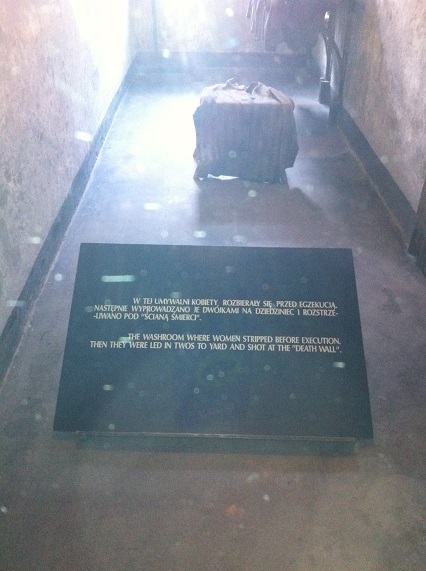 The gas chamber at Auschwitz One. 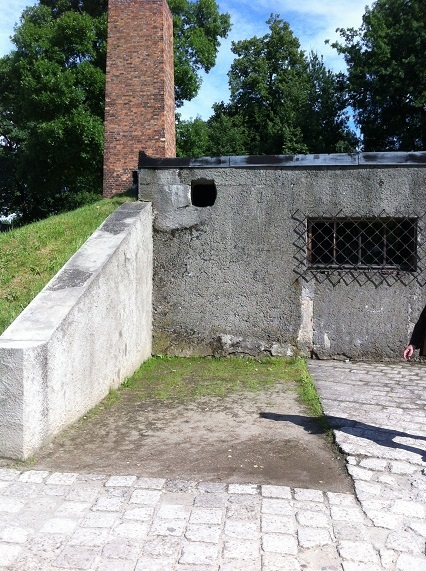 At first this gas chamber was used and about 10,000 prisoners were murdered in this very room. But it took too long and the demand for death demanded greater efficient and capacity. The moment the gas was introduced, in order to drown out the screams and groans of the dying people, the motor of a lorry, parked there for this purpose, was switched on. 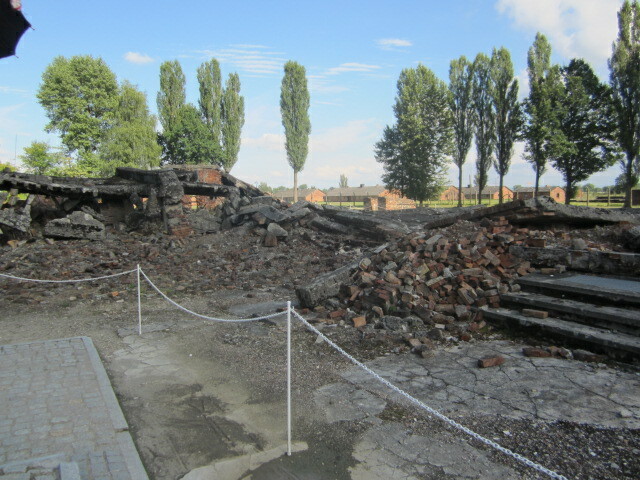 The modest capacity of the crematorium, which could cope with 340 corpses in the space of 24 hours and the difficulty of keeping the whole action a secret, resulted in the operation being transferred to Birkenau. In this harmless looking building 10,000 found their death. 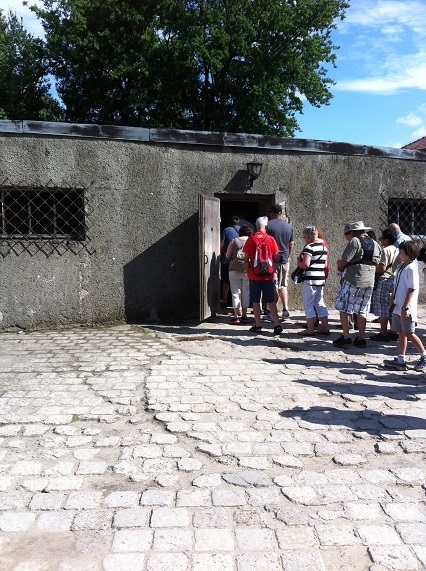 Innocent tourists walking into the gas chambers. And they wonder how the inmates were duped. At this very spot terrible screams were heard. The Germans could not tolerate this and needed to keep the truck engines running to drown out the unpleasant sounds. Why can't people just die quietly? Imagine standing here, freedom is just over the fence...but it might as well be in another galaxy. 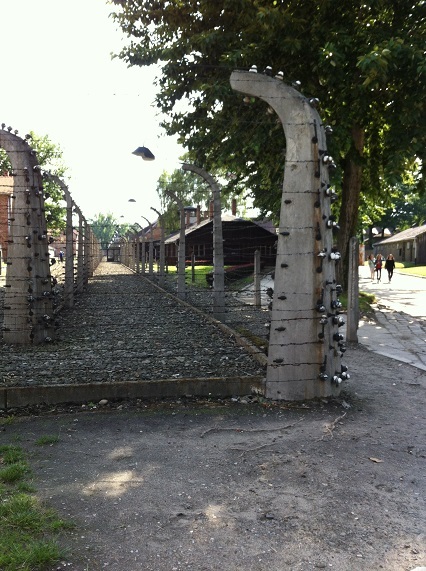 Auschwitz death camp was not big enough, not efficient enough of a death machine. After all, there were more than 3 million Jews in Poland alone, plus the Hungarian Jews, my family amongst them, who arrived in May - June 1944. Plus of course the Soviet prisoners of war and Gypsies. 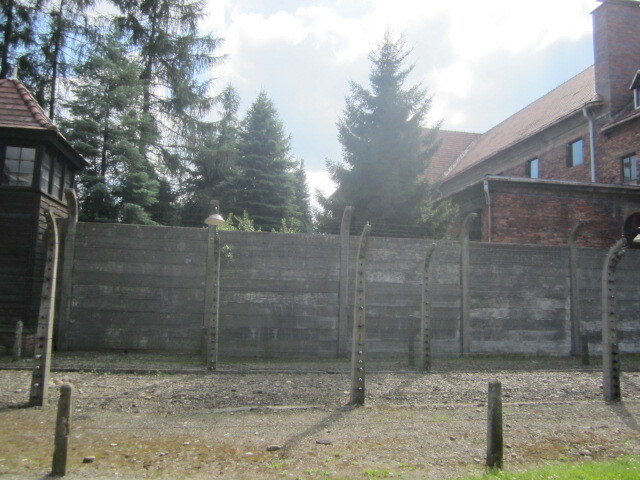 On the bus from Auschwitz to Birkenau, the fence, the barbed wire. Here were many of my current neighbors; survivors, witnesses. Here were the parents of friends from down the road, and here were the many many members of my mothers' family. In those days there was no grass here. 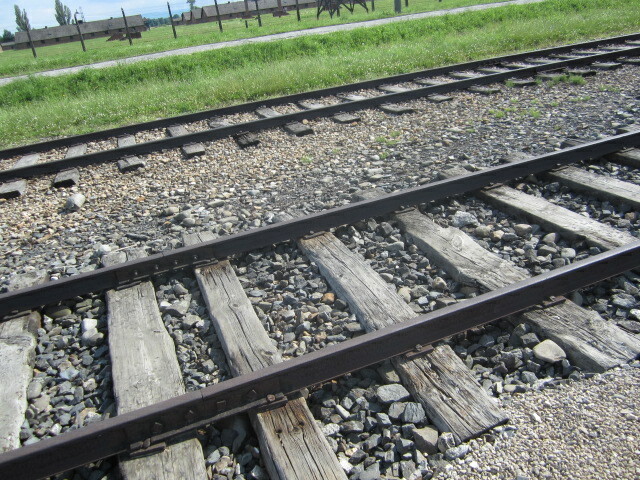 Over these tracks rode trains that carried more than a million human beings to their deaths. Blood tracks. 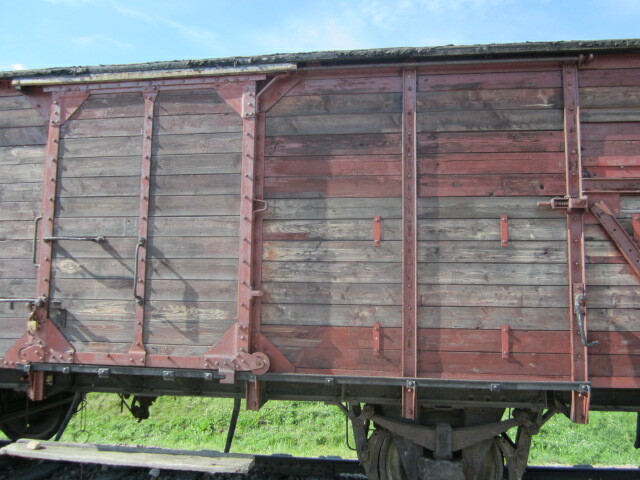 An original cattle car that brought prisoners, Jews from Hungary, to Auschwitz. 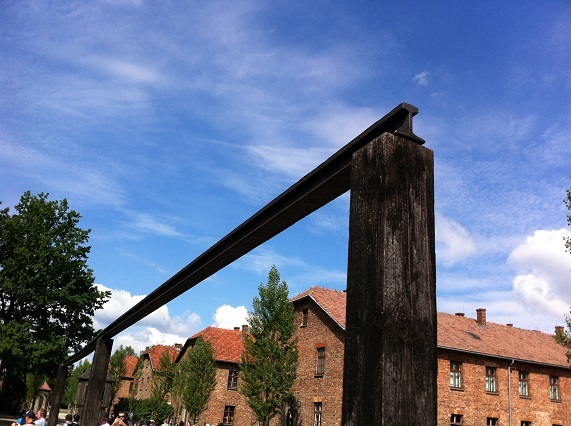 This was located and restored to Auschwitz by the son of a man killed here. The man, a religious Jew, was forced off the train. But he wanted to go back and get his prayer bag; his talith and teffelin which he needs for his daily prayers. The guards told him he cannot go back. He waited until he thought no one was looking and made a run for it. He needed to have his prayer items. He was shot dead then and there, on the spot. 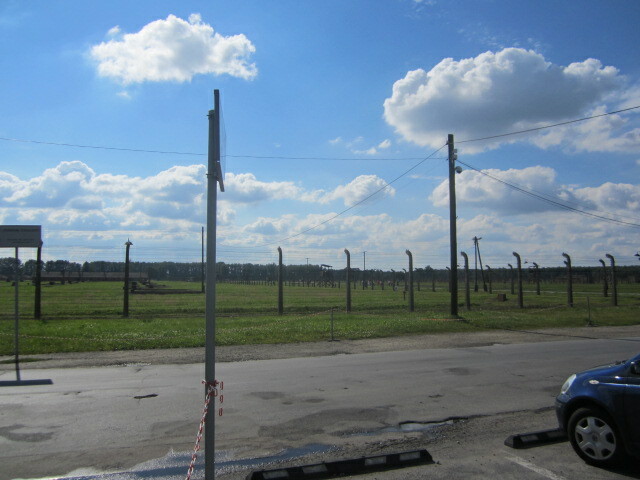 Looks so peaceful now but this is a death camp! At this stop terrified Jews from all over the world were pushed off the train. Some had come from as far away as Greece and Norway, some had been in the train for two weeks. 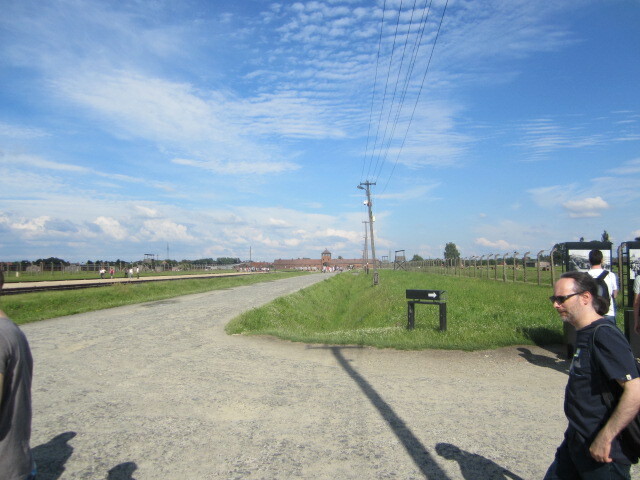 Minus the green grass that did not exist there at the time, this is what the clueless prisoners saw as the approached Birkenau. Little did they know the horrors that lay ahead. In my own family I have heard stories, heartbreaking stories of the events that took place here. How many of my family died here, I will never know. But of my great grandfather's family only 1 of 11 siblings survived, the one who emigrated to America on time. 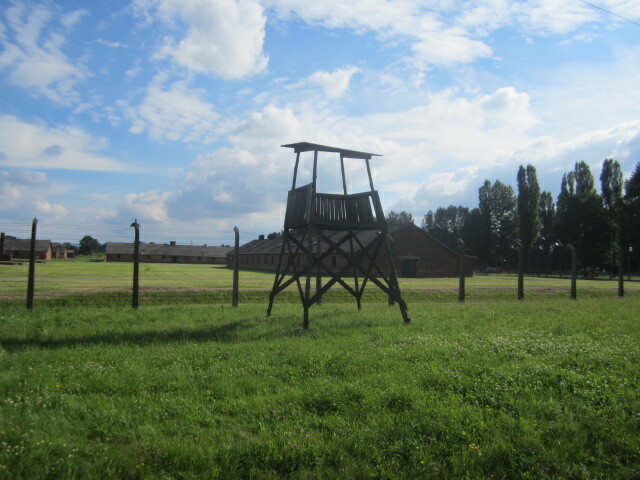 One of the remaining watch towers. The site of these would evoke great fear, today - Silent! The Germans tried to destroy all evidence of their crimes. 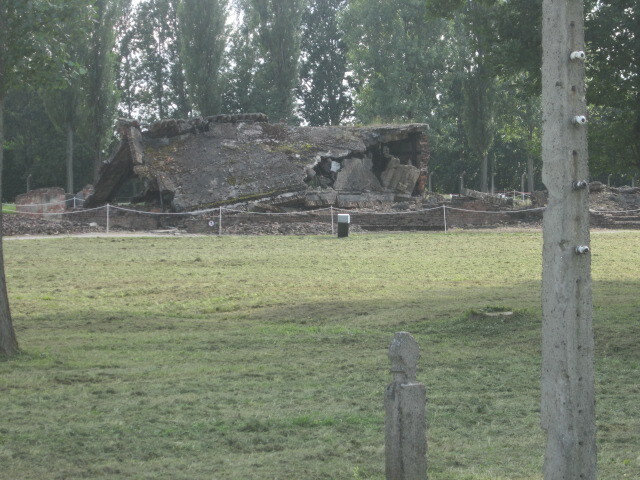 As such they bombed the gas chambers, but the remains still stand as a silent witness on behalf of the more than one million murdered here. "We discussed the ways and means of effecting the extermination. 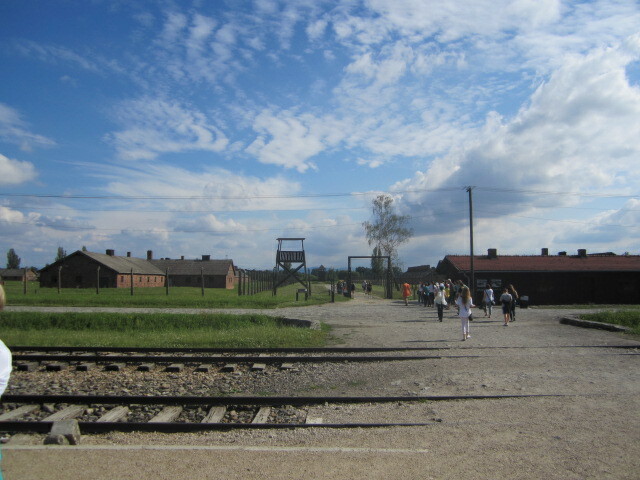 This could only be done by gassing, since it would have been absolutely impossible to dispose by shooting of the large numbers of people that were expected, and it would have placed too heavy a burden on the SS men who had to carry it out, especially because of the women and children among the victims". "It can be said that about one-third died straight away. The remainder staggered about and began to scream and struggle for air. The screaming, however, soon changed to the death rattle and in a few minutes all lay still. After twenty minutes at the latest no movement could be discerned. Those who screamed and those who old or sick or weak, or the small children, died quicker than those who were healthy or young." 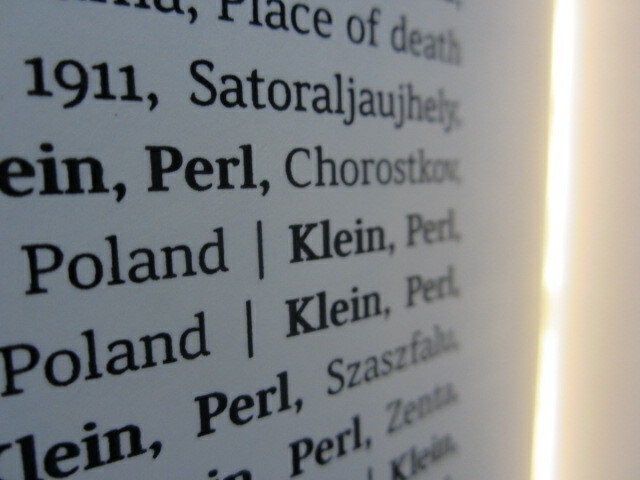 The victims of Auschwitz Birkenau spoke 22 different languages. 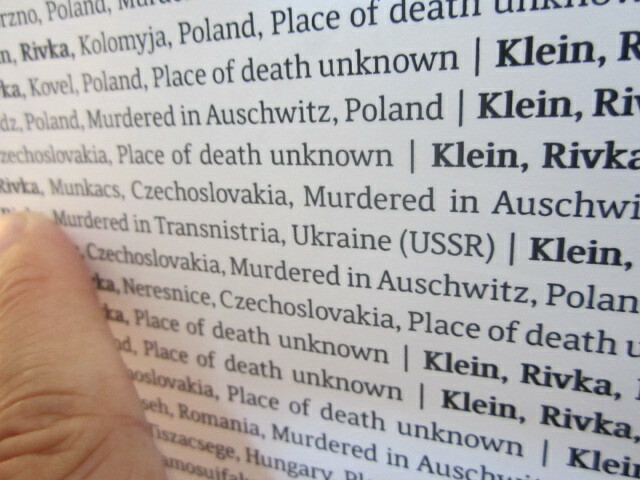 There is a monument in each of these languages for the voices silenced. I am standing at one. 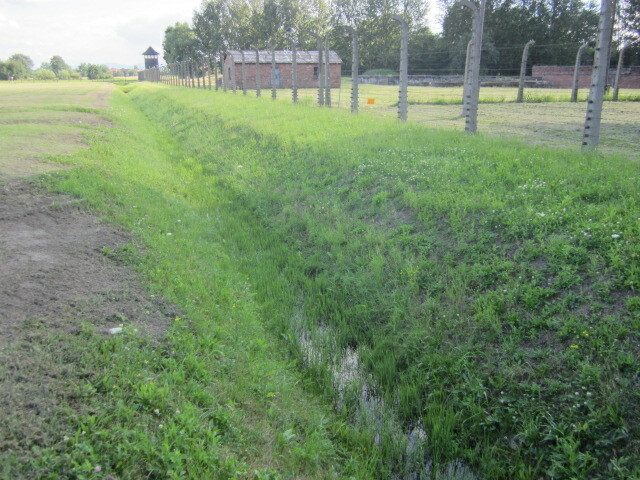 Electric barbed wire and trenches. 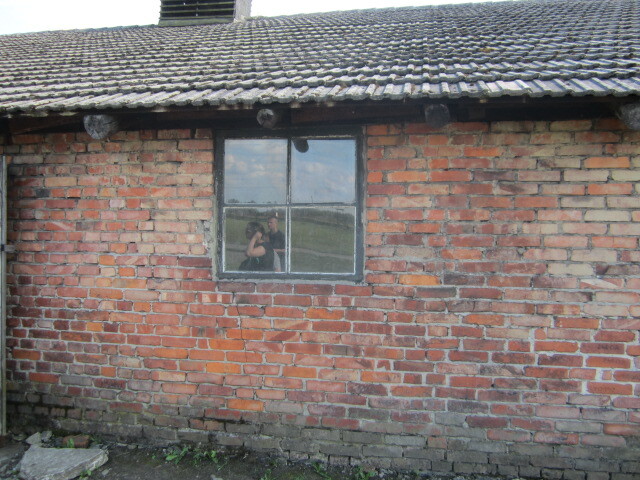 One of the brick buildings. Horrible "living" conditions. Sometimes the temperature reached minus 20 degrees. 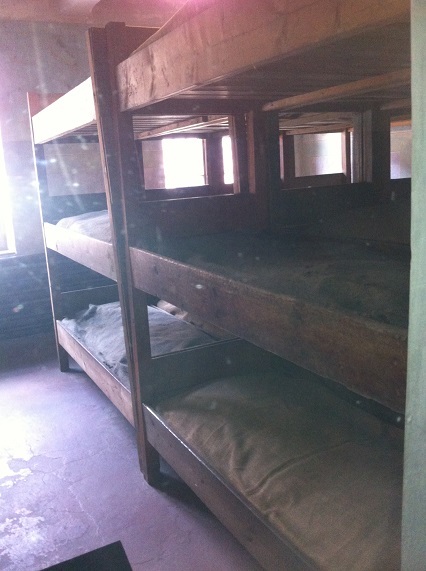 No one wanted the bottom bunk due to the cold and the rats. Many slept on each bunk. It was so tight that if one person moved, all had to move. "Graves". 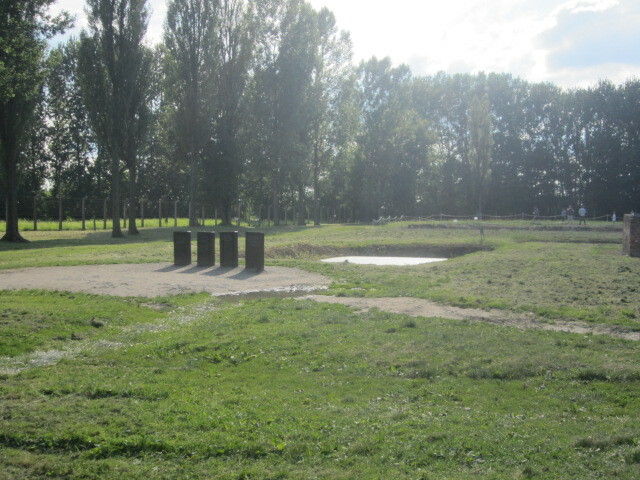 No one in Auschwitz-Birkenau was given a grave. 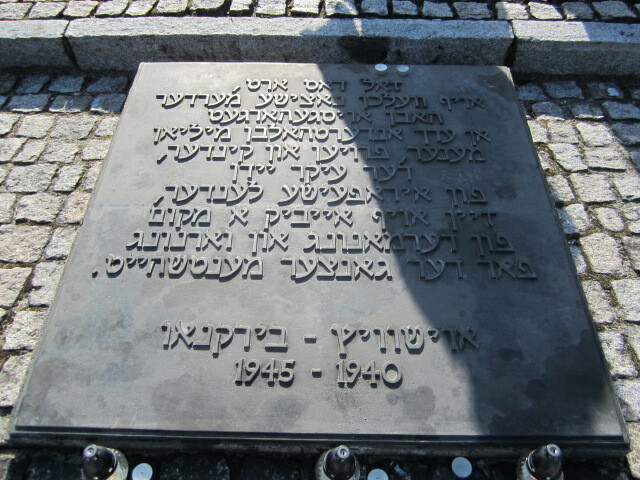 But human ashes were found here and 4 stones were erected as a symbolic grave for the more than 1.5 million murdered here, 90% of which were Jews. Human ashes are still here. As I walking along suddenly from a distance I notice the Israeli flag! Of course I know that many Israeli groups come here and I was wondering how many I would see but this was special. As I get closer I see our army and our police, the Israeli armed forces. 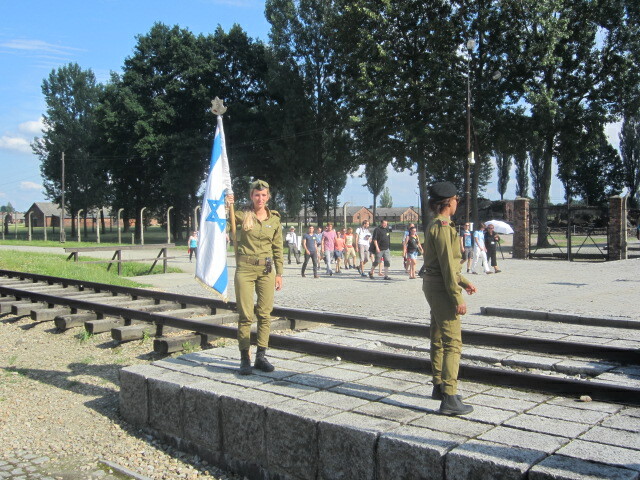 Here they are at Auschwitz-Birkenau to pay their respects and to educate the young soldiers and officers. This is part of our heritage and they must know this to be good soldiers. They must know that it is they, the soldiers of Israel that is the only defense we have that this will never happen again. They must know that it is upon their soldiers that our safety lies. 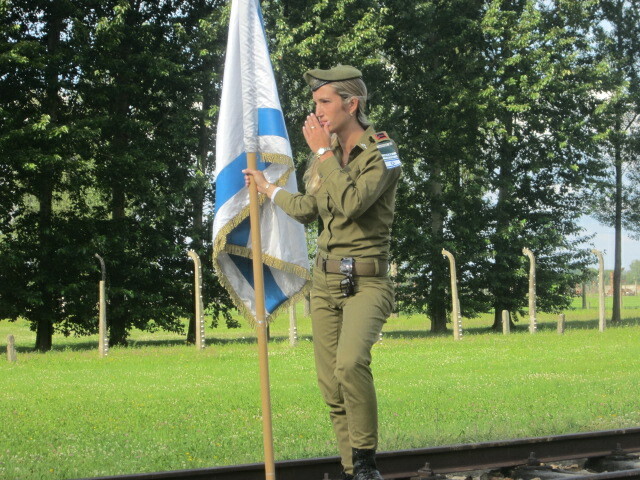 They must know that here stood their grandparents and great grandparents, in stripped clothing, scarred, freezing, terrified, and now they stand here; Proud, strong, determined that Never Again shall this happen to the Jewish people. 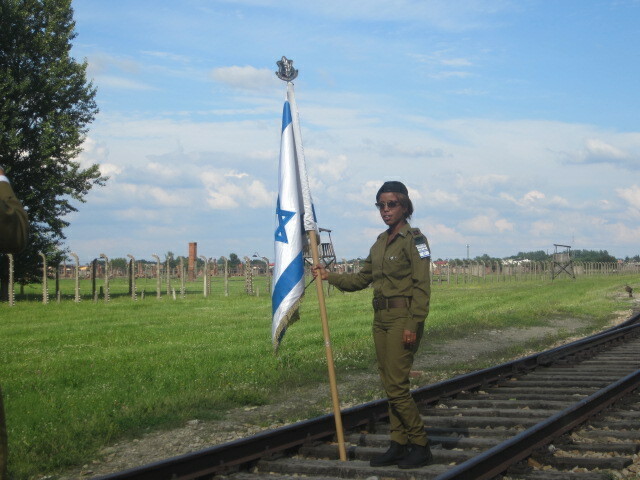 Black; Israelis and Jews come in all colors. This is our shared heritage, even for those whose ancestors did not come from Europe. On the tracks that lead so many to their deaths. Looks like a great place for a summer camp, but it was HELL. In those days there was no grass and the suffering was beyond human expression. We must remember. Each prisoner only a few seconds, 3 times per day, to take care of his/her needs. The horrible food created a situation of terrible bowel trouble. 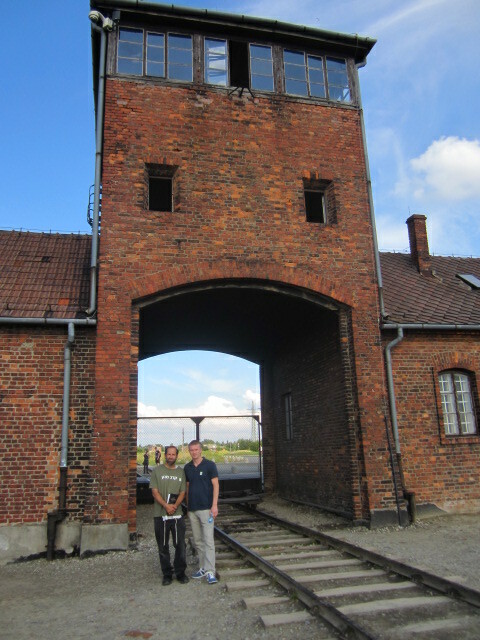 Moshe and Tomasz at the entrance to Birkenau. 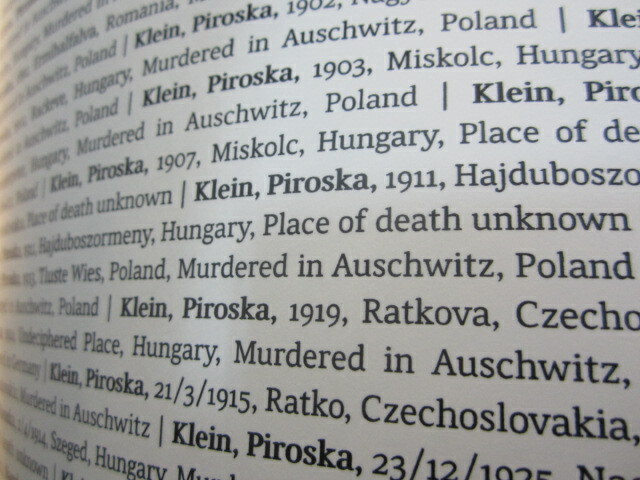 When the tour is over I go to the "book" to search for my relatives. 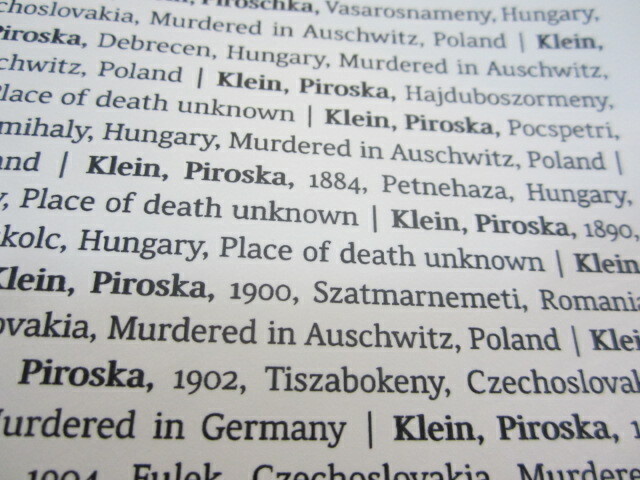 But even I could not fathom that the "book" takes up an entire room and the names are too many. Here I am searching for our relative Piri Klein from Munkatch, but there are so many Piri, and Piroska Klein who were murdered here! 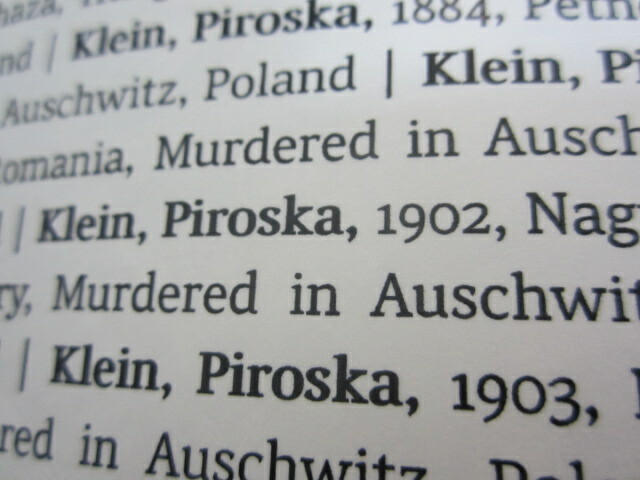 So many Klein, Piroska, and Klein Piri, "Murdered in Auschwitz", which one is ours? 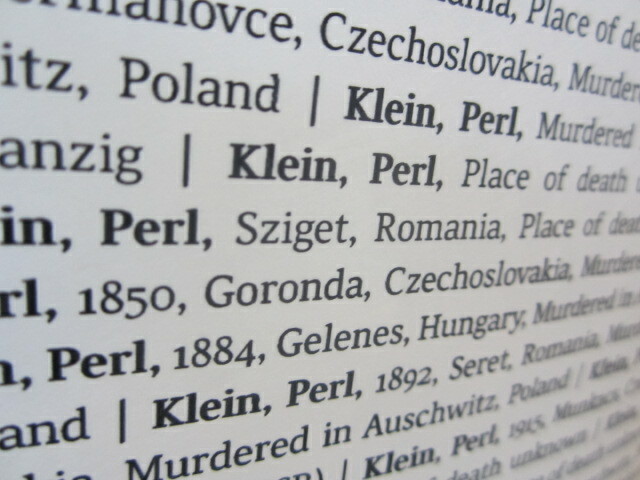 Perl Klein, my great great grandmother. Klein Helen, could be our Helen Klein? Dedication: This photo/blog took a great deal of time and effort to put together. I dedicate it to the memory of my family, the one section that I know of. I only have a vague idea of the fate of one quarter of my family, one of four grandparents, that of my grandfather Rabbi Isaac Klein of blessed memory. His father Shmuel came to America but his ten siblings and mother did not. His father died before the war and merited a proper Jewish burial. 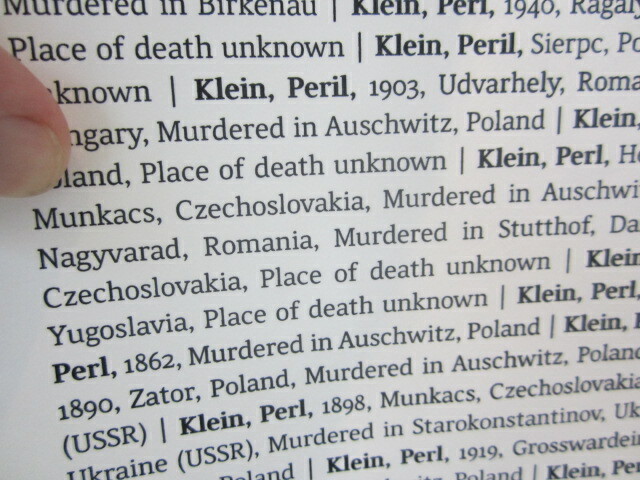 Perel Klein, and her children: Perel died either on the train to Auschwitz or upon arrival in Auschwitz, if any relatives are reading this and have information please contact me below. Adolph - Was the son of Shmuel who came to America. Adolph did not come to America. Menachem - Of his 4 or 5 children only one survived and moved to Israel. David - Both he and his wife perished. Yehuda - His wife survived. He had a daughter named Ducie who emigrated to America. Morris (Moshe) - Had a child Ze'ev, or Hersch, who survived and moved to Israel. Ze'ev became a high ranking officer in the Israeli army. His wife and two of their daughters perished but several other children survived. Among them Ander of blessed memory, whom I knew, Zoltan of blessed memory whom I knew, Chanku of blessed memory, whom I met met. And Joe whom I have not had the privilege of meeting. Martin (Meyer) -Lived in Goronda. Had four children, two boys and two girls. The girls perished. The two sons survived and moved to Israel. 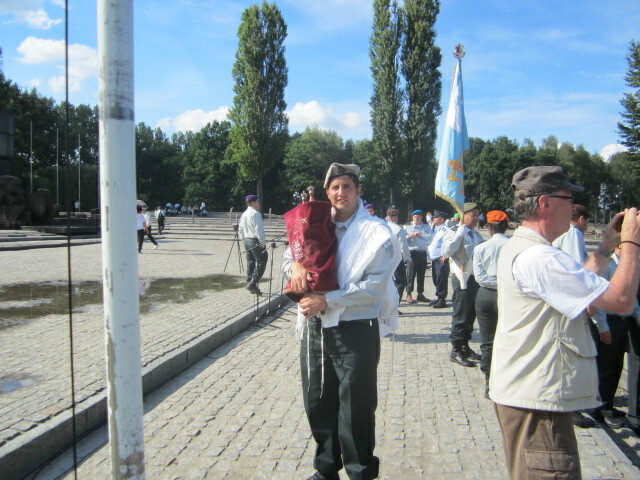 Bumi (Avraham) - Never married and perished in the Holocaust. Pessel - Was married and lived in Borobash. They had 4 or 5 children. Shandl - Was married and lived in Woronov, Slovakia. They had two daughters who were taken to the Russian front to "serve the pleasure of the German soldiers". The entire family perished in the Holocaust. Rivaka Rachel - Was married and lived in Homono, Slovakia, they had several children but only one survived. His name was Tibor Shoenberg, he lived in Germany after the war and died there. 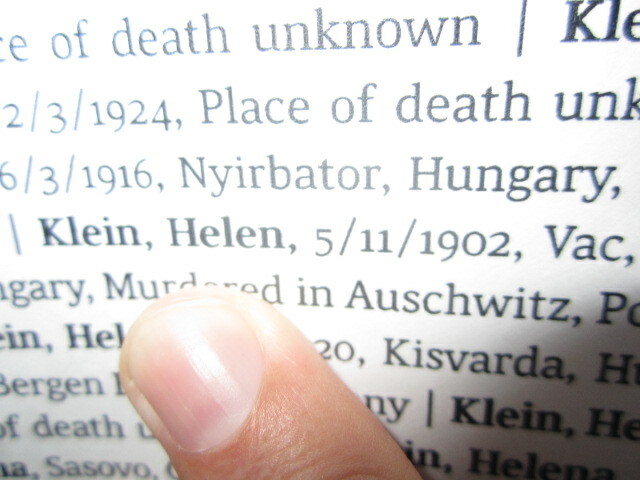 Helen - Lived in Slovakia. Was married with children, of whom only one survived and moved to Israel. His name was Oli (Yitzchak) Perlstein.